The summer of Love was a social phenomenon that occurred during the summer of 1967, when as many as 100,000 people converged on the Haight-Ashbury neighborhood of San Francisco. Although hippies also gathered in major cities across the U.S., Canada and Europe, San Francisco remained the epicenter of the social earthquake that would come to be known as the Hippie Revolution . 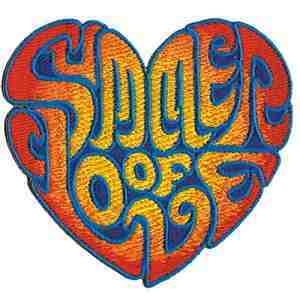 Commemorate this revolutionary time in American history with this vibrantly colored summer of love, heart shaped patch. This patch measures approximately 3.5" x 3.5" and is iron on adhesive.